Ruth A. Witherspoon, who taught at Barry Law School as a visiting professor in 2009-2010, returned in 2011 as the Associate Dean for Academic Affairs, bringing with her more than 26 years of experience as an administrator in legal education. Prior to serving as a visiting professor at Barry, Dean Witherspoon was among the founding faculty at the Florida A&M University College of Law and served the law school from 2001-09 in various capacities, including as Associate Dean for Administration and Student Services, Associate Professor, and Interim Dean. 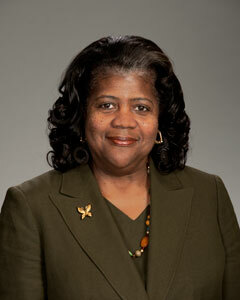 Prior to her work at FAMU, Dean Witherspoon was on the faculty at Florida State University College of Law, where she directed several programs and operations, including the Academic Support Program, the Pro Bono Program, and the Summer Law Program for Undergraduate Students. She has also been on the faculty at the law schools at the University of Connecticut and the University of Nebraska, where she served as an associate and assistant dean, respectively. Witherspoon has taught Professional Responsibility, Advanced Ethics, Health Care Law, Sales, Legal Writing, and Bioethics, and has done research in the areas of legal ethics, professional responsibility and elder law. She has served on various professional committees and community boards, including the Florida Supreme Court’s Standing Committee on Fairness and Diversity, where she served as co-chair of the Research Subcommittee.